If you want to grow Carrots, you need to make sure that the ground they are going into is rock free. If there are rocks, your carrots will find a way to grow around them and you will end up with some funky looking carrots. Carrots like loose soil, so if you have a spot with loose soil to about a foot deep, put your Carrots in there. Aside from rock free soil, they are pretty easy to grow and in about 70 days you can pull up beautiful long carrots. You can seed them about 1/2 inch apart, then thin them once the roots are large enough to nibble on. Here’s about 10 rows of Carrots that were planted last year. The thicker you can sow them, the less weeds you will get. You can see I have planted them in a wide bed – when we grow carrots, we don’t bother with single rows. 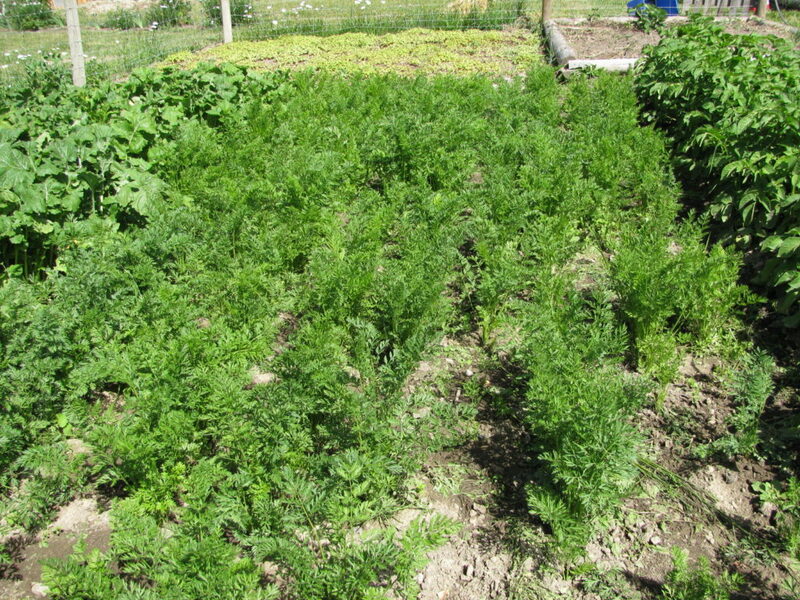 We grow carrots by planting wide beds; the bed is much faster to get seeded. We end up with more carrots doing them this way rather than to grow carrots in a single row. Sowing thickly will also help keep the weeds down between rows as well as between the plants. Carrots are a bit of a pain to weed, but well worth it as they taste so good! They would rather grow in cool weather so they can be seeded as soon as you can work your soil in early Spring. Remember that Carrots take awhile to germinate, so don’t worry if you cannot see a sign of germination for 10 days or so. We sometimes seed a few Radish in the rows as well. Radish germinates quickly, so we can tell where the Carrot row will come up. This is very helpful when we are trying to do early weeding. An early Harvest of Carrot thinnings and Lovage. 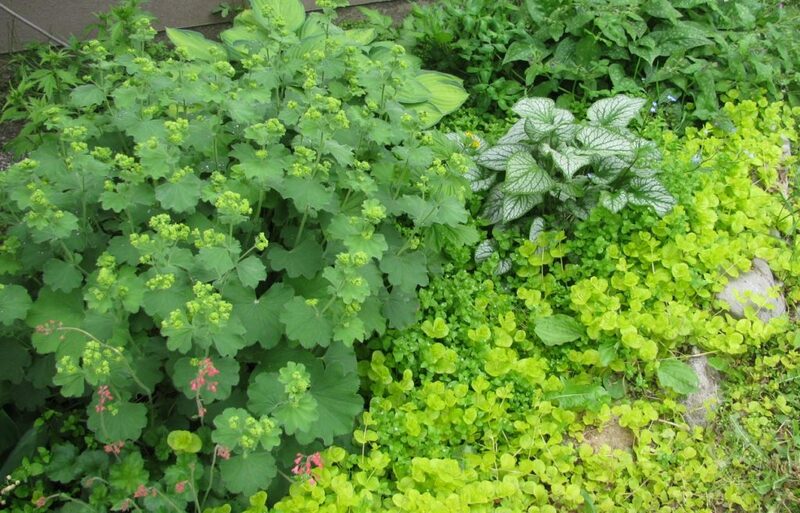 Lovage is a wonderful herb and we have a perennial plant, so it keeps returning every year. Each Spring, I cut lots of stems so I can dry Lovage, as well as other herbs. By the time mid-Summer rolls around, we are able to pull carrots fresh for our dinner table. We grow several rows so that we can keep some over Winter. 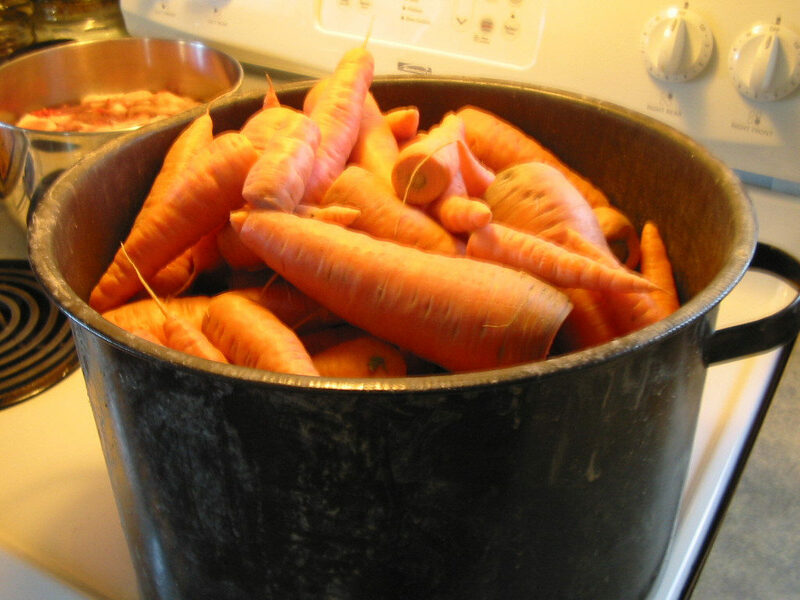 A large canning pot full of harvested Carrots. 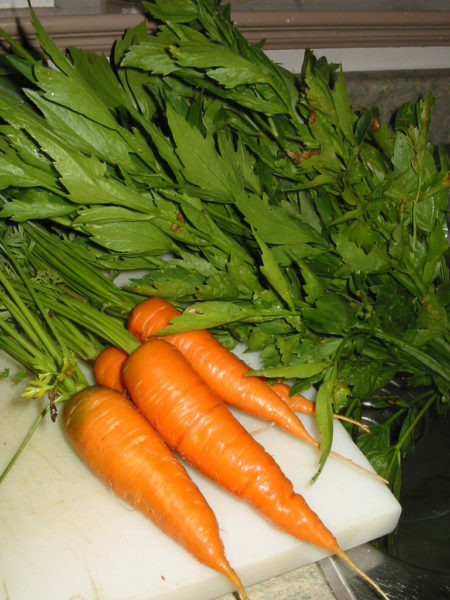 These were used to make some Carrot Wine – here’s the recipe if you would like to give it a try. I have canned carrots before to eat over winter, but we prefer them fresh or stored in our root cellar. In the picture above, you can see how we store the Carrots. I take a bucket down to the garden, and put a layer of soil in. Then I use a pitchfork to carefully pry up the carrots. Don’t try to pull them by hand unless you have very loose soil. It is very easy to snap the greens off the top and then you are left with the root still stuck in the ground. After getting the Carrots out of the ground, I trim the greens. 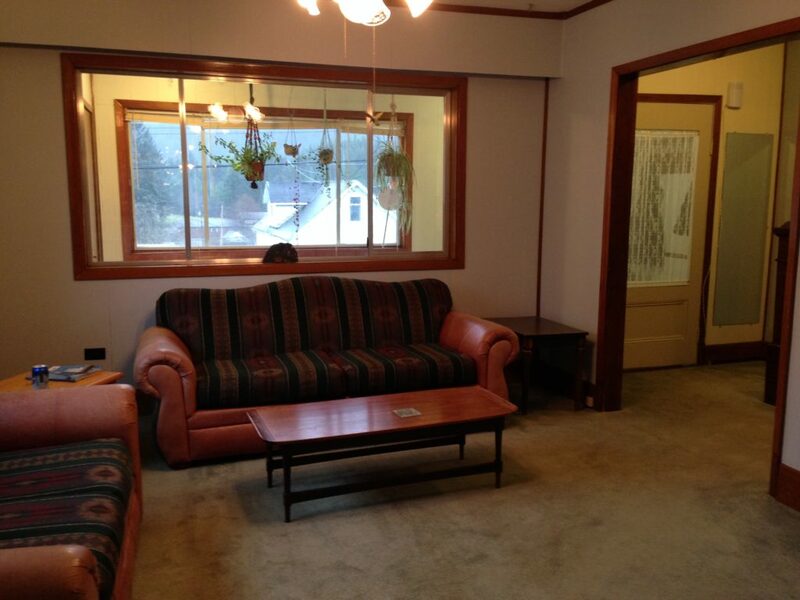 Do NOT trim them right down, just leave an inch or so. Then put a layer of Carrots into the bucket. Add another layer of soil. Then add another layer of Carrots. Keep going until your bucket is full. 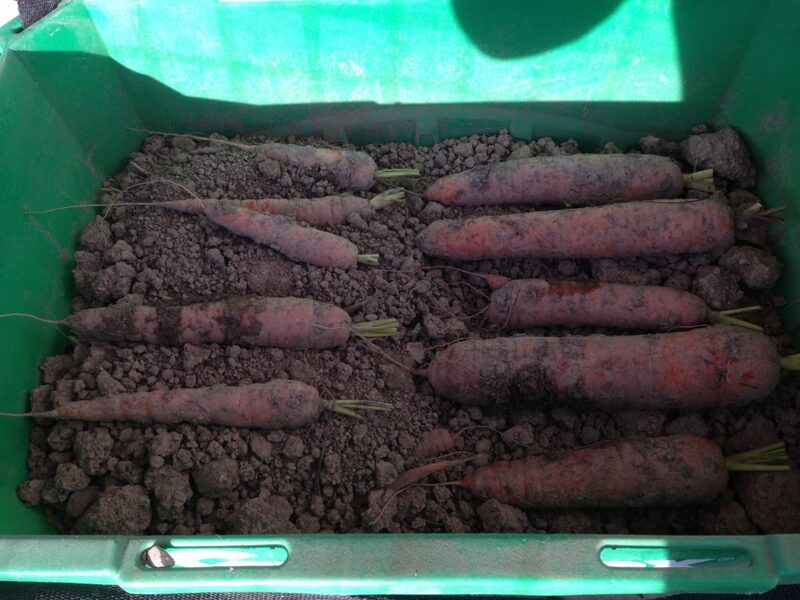 Make sure the top layer is soil, enough to completely cover the Carrots. Now they are ready to be stored in the Cold Room or your basement, wherever you can keep the temperature between 32 and 40F. We do this every Fall and come January, the carrots we get from the Cold Room are just as delicious, firm and sweet as the day we harvested them in September or October. 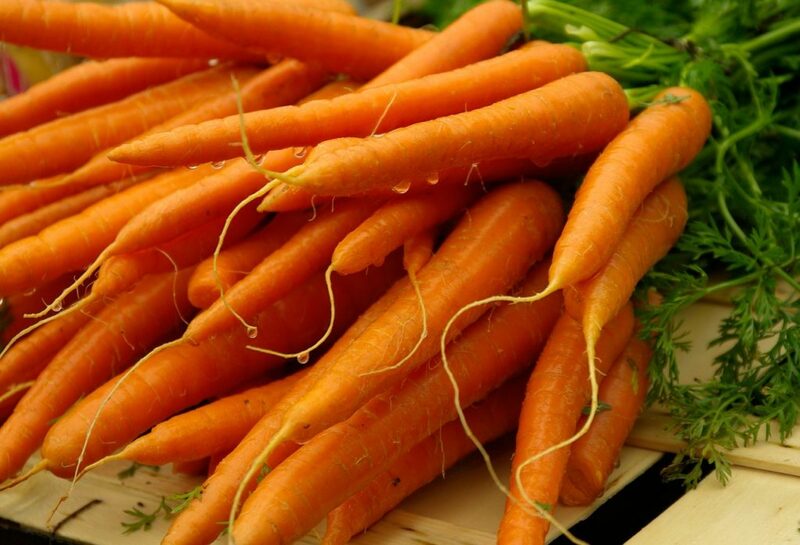 If you grow an Heirloom type of Carrot, why not leave one or two in the ground over Winter? The following Spring, you will see some new growth coming from the Carrot tops. Leave the Carrots alone until the Fall. You will see your Carrots start to bloom then flower. When they are finished flowering, they will produce seeds on the top. 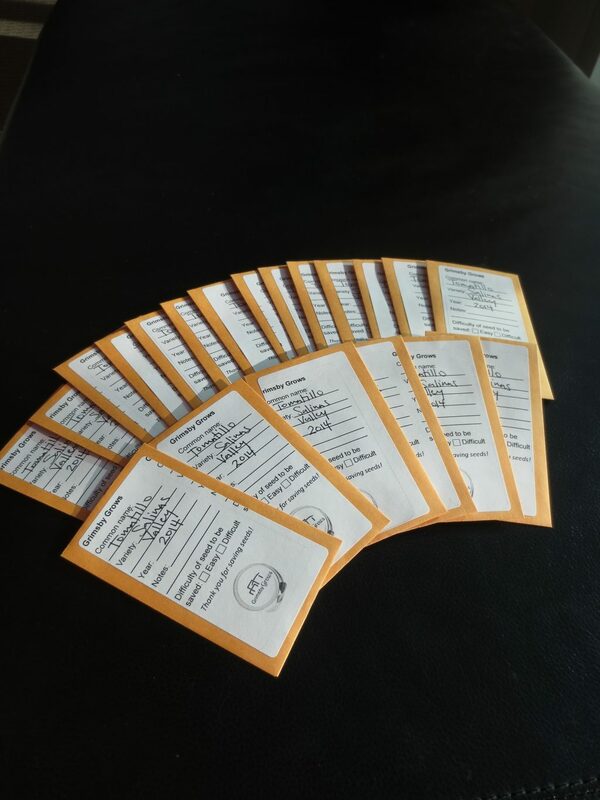 Gather these and plant them the following year. You won’t need to buy Carrot seed the next year – you can start planting your own. 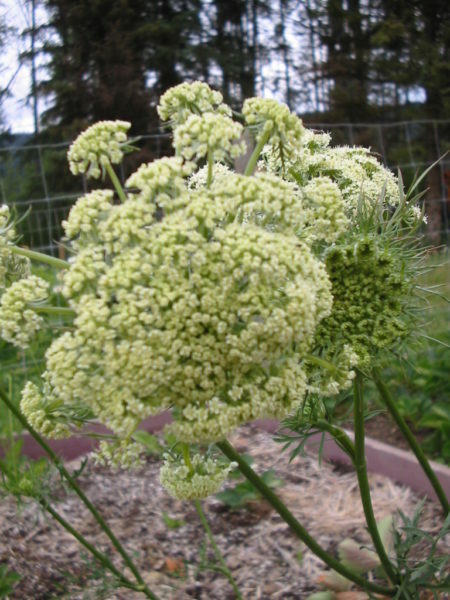 Do this every year with a Carrot or two and you will never need to buy Carrot seed again. So, grow carrots this year. They are a great source of Vitamin A, which you need for good eye health and most people like them. Why not plant a row or two this year? How to grow Potatoes – everything you need to know. Zucchini are really easy to grow and you will get huge harvests! Here’s how to grow Zucchini. 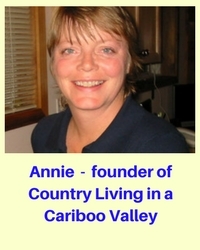 HI Dianne, thanks for coming by…altho living here doing what we do is a lot of work in the summer, we get to relax, rest and play all Winter long. We love it!